Like many others, I am a huge fan and supporter of the Makeup Geek line. Their products are outstanding, very affordable and Marlena is a doll! When I found out that they extended their brand to makeup brushes, I was very excited because like their makeup, their brushes are affordable as well. Makeup brushes play an important role in applying makeup and sometimes they are what makes or breaks a look. These brushes are cruelty-free and vegan which is a huge win in my book! I was contacted by Makeup Geek and was asked if I would be interested in reviewing ten of their brushes for you guys. If you want to know my thoughts on the brushes, then keep on reading! Some or all products shown in this post may have been provided by the said brand(s) and/or website(s) for potential review and/or use. This blog post contains affiliate links. For more information, please read my DISCLAIMER. Product Description: Applies both liquid or cream foundations fast and streak free. The large quantity of bristles picks up just the right amount of product, evenly dispersing it onto the skin for an airbrushed finish. The smaller size and angled tip fit perfectly around the eyes, nose, edges of the face and along the hairline for precise and flawless coverage. Apply your makeup in style & guilt free with our new brush design! My Thoughts: I really love this brush! I use Tarte's Amazonian Clay Foundation with the brush and it applies the foundation beautifully onto my skin. The bristles are dense which helps buff in and blend out the product without having to use too much. It's also soft and it doesn't stab my face like some other face brushes do. One feature that I love is the angle of the bristles. It gets into those hard to reach places like around the nose and under the eyes with little effort. Product Description: Buff it out! Designed for buffing powder into the skin, buffing out any harsh blush and/or foundation lines, and leaving your skin looking naturally flawless. This versatile brush also works well softening the edges of contour lines, or doubling as a blush brush in a pinch, adding blush to the apples of your cheeks. The soft yet firm (synthetic) bristles are densely packed for optimal buffing power. The rounded edges are ideal for flawless blending and working around the nose/eyes areas of the face. Once you've worked with this brush and it’s many uses, you won’t be able to imagine your collection without it! My Thoughts: Sigh. This brush is a dream. It is so soft and fluffy, I just want to rub it on my face all day long. The bristles are super dense which makes applying powder a breeze and it also makes the product go on evenly and helps give you a fuller coverage. It works amazingly as a powder brush, but like the description says, you can use it many different ways. I also use this to tone done my blush and contour and it does the trick! I also love the size of this brush. It's small enough to carry in my makeup bag and it feels comfortable in my small hands. Product Description: The narrow width, and angled tip of this brush were specifically designed to easily apply color to the face. Following your natural bone structure while you contour, this brush adds dimension, which can help slim and shape the facial features. Most commonly used with a darker powder (a few shades darker than your skintone), and applied it under the cheekbones, the dense, synthetic bristles of this brush pick up just the right amount of color, and evenly apply it to the skin. This brush also works well in applying blush, and bronzer for a flawless, natural looking glow. My Thoughts: This brush does what it's supposed to do. It's just the right size and angle to use in the hollows of the cheek to contour and also to bronze the face. It grabs on to just enough product to define your features without going overboard. Not as soft as the bristles in the buffer brush, but they're still soft and comfortable. Product Description: The rounded blush brush is the perfect way to apply just the right amount of color to the cheeks! The rounded edges assure a smooth and well blended application, and the circular shape is ideal for working the color into the apples of your cheeks. Due to it’s smaller size, this brush also works great for contouring. The longer handle balances the brush head for a comfortable and controlled application. My Thoughts: Out of all the brushes I received, this is my least favorite. It's not a terrible brush, but for applying blush, it just doesn't work very well for me. I like my blush to look well blended and seamless and this brush is so small and the bristles are so dense that it makes the product go on too harsh and concentrated. Every time I use this brush, I have to buff out the color because it's just too intense. If you like your blush to be intense, then you'll like this brush. If this brush was bigger and fluffier, then it would be a winner. It's still a great quality brush that I can use for other things, like contouring or highlighting. Product Description: Illuminate and add dimension to your cheekbones with just the right amount of your favorite highlighting product. Whether you're using cream, liquid, or powder, this soft stippling brush is specifically designed to pick up small amounts of product for sheer, even coverage. This brush also works great for stippling on your foundation, applying a sheer but buildable amount of cream blush, and lightly adding set powders for a flawless, finished look. My Thoughts: Another super soft brush! This duo-fiber brush makes applying highlighting products simple. It's so easy to get carried away with highlighting products and this brush is designed to keep that from happening. Since it's not as dense as the other face brushes, this one applies product lightly and evenly. Great size for applying highlight to the cheeks. Product Description: This multi-talented brush is a must have! It’s soft bristles ensure that less powder will be picked up, where the dome shaped tip feathers the shadow and allows for easy blending. Perfect for blending out the crease, softening any harsh lines, dusting set powder under the eyes, or blending eye shadow when only a little color is desired. My Thoughts: I adore this brush! It's one of my favorites. It's comparable to MAC's 224 brush. This brush applies product beautifully and blends it wonderfully. Its rounded and slighted pointed tip makes application a cinch. Not only is it soft, but the shape works harmoniously with the eyes and does it's job amazingly! Product Description: Blend, blend, blend! It’s what this brush does best. From it’s soft bristles, small size, and angled shape this brush was made to flawlessly blend out your shadows for an overall seamless look. However, don’t underestimate what this brush is capable of! This brush also works wonders forming to every contour of the eye. The thick bristles easily add color to create depth in the crease and add definition to the outer part of the eye. This versatile brush is the perfect addition for anyones makeup brush collection. Apply your makeup in style & guilt free with our new brush design! My Thoughts: This brush is so versatile. You can use it to blend out the crease, apply shadows to lids, darken outer corners, or even use it to highlight. Although this brush is not as soft as the Soft Dome Brush, it's versatility makes it worth while. Product Description: This brush works well for adding color to the natural crease of the eye, and blending it out. Slightly larger in size, with a pointed tip, this brush covers more area in one swipe. The pointed tip of the brush will help prevent over blending in cut crease looks. My Thoughts: If you are a fan of cut crease looks, then this brush is for you. With it's round pointed tip and stiff, dense, yet soft bristles, you get a precise application without much effort. Product Description: Perfect the ever popular smokey eye in a breeze! Designed specifically to blend out darker shadows and buff away any harsh lines, the densely packed bristles and short rounded shape of the brush are ideal for achieving the smokey eye look. My Thoughts: This brush is a must-have for the smokey eye lover! The soft bristles are super dense and short to help you achieve your dream smokey look. You can use it to pack on color on the lids and also use it blend out harsh edges. Product Description: The classic Cat Eye is timeless and can be the perfect way to glam up any look. Trouble is it isn’t always the easiest to achieve! However, with the right tool this look can be done in a breeze. The Bent Liner Brush makes for easy application, for both gel and cream liners. It’s small size, and angled ferrule do the work for you, perfectly aligning to your lashline. The bristles form to a fine point that delivers precise lines, ideal for creating the perfect flick at the outer corner to finish off your look. My Thoughts: This is my favorite type of brush for eyeliner, and this is hands down the best one I've owned. I love that it tapers off at the end to help create crisp, clean lines. The bent shaped is very helpful with applying eyeliner because it makes applying the product close to the lashes easy without blocking your vision. This brush is a must-have in my brush collection! Overall, I think that these brushes are spectacular. The quality is outstanding and they look and feel a lot more expensive than they really are. Some of these are even small enough to carry in your makeup bag, which is awesome. They perform just as well, if not better than some high-end brushes on the market. They are well made and feel nice in your hand. They're not too heavy or too light, and they aren't overly big either. The fact that they are vegan and cruelty-free makes them so much more amazing and appealing to more people, including myself. They are wallet-friendly and these are a especially great for people who are just starting out with makeup, someone who is building their makeup brush collection, or for someone who is building their makeup artist kit. Once again, Makeup Geek does not disappoint! If you are interested in trying out these brushes or Makeup Geek's other products, then visit their website, MakeupGeek.com! I hope you enjoyed this review and that you give some of these brushes a try! 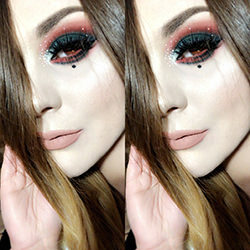 What are your favorite Makeup Geek products? I just love these brushes and I adore their eyeshadow pigments and gel liners too! Ive had my eye on the contour brush & bent liner brush for a while. Im glad to see that they are just as awesome as the makeup line! I can't wait to read lots of your posts.Thanks a lot for sharing. Keep blogging.